The FIA World Touring Car Championship’s category for privateer racers will step up to another level in 2016 with a new name, increased monetary support and the ultimate goal: to follow in the wheel tracks of champion driver Norbert Michelisz by landing a factory seat in the WTCC following success as an independent. 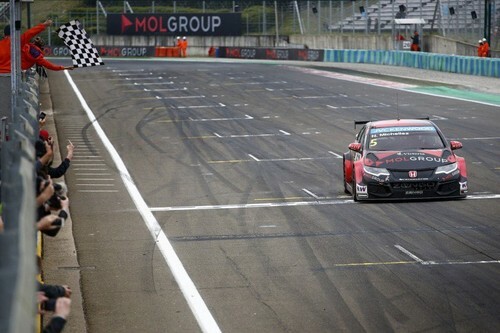 Michelisz finished 2015 as the WTCC’s top privateer and his endeavours, which included an outright victory and pole position, didn’t go unnoticed with Honda Racing signing him for its works squad for the 2016 season. And the man he beat to the independents’ title, Mehdi Bennani, was the first to announce his WTCC Trophy bid for 2016 when he’ll be hoping for a chance of his own with a car manufacturer. To be eligible for the WTCC Trophy, drivers must race without direct financial backing from a manufacturer. And while they won’t have access to the same funding as their factory-run counterparts, the WTCC Trophy contenders effectively compete on a level playing field with the same sporting and technical regulations covering both categories. In 2015, Bennani, Michelisz, Toms Chilton and Coronel and Hugo Valente all scored overall podiums. As well as the honour of helping their driver to the prestigious WTCC Trophy, teams will receive a share of the 500,000 Euros support package, double the amount offered in 2015, while a promotional package includes coverage on FIAWTCC.com, dedicated airtime in WTCC coverage produced by promoter Eurosport Events, plus the opportunity to participate in various promotional activities and initiatives. WTCC Trophy points are awarded to the first eight drivers classified in each race on the following scale: 10-8-6-5-4-3-2-1. One point is awarded to the highest-placed WTCC Trophy competitor in qualifying and for the fastest lap in each race. The top three WTCC Trophy finishers in each race will be presented on the podium with the category winner of each race attending the post-race press conference. Private entrants will also be recognised through the WTCC Teams’ Trophy for non-factory outfits with the first two cars from each eligible team scoring points in each race on the following scale: 10-8-6-5-4-3-2-1.